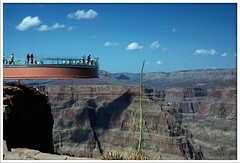 A coworker mentioned the new Grand Canyon Skywalk. A new U-shaped, partially glass bridge goes out over the edge of the canyon. On my PSP, I have a game called Monster Hunter Freedom. *crickets chirp*. Yeah, you’ve never heard of it. Nobody in the US has. It’s a dinosaur-hunting RPG that has support for multiple players if they’re in the same room…you know…all those players in Albuquerque…ok, there aren’t any. But in the bizarro world of Japan, it’s hugely popular, as shown by this Monster Hunter Rally. This picture is astounding to me. It’d like being a fan of curling…not the ice sport, but actual hair curling…and then finding out they’ve added hair curling to the olympics. Author nalterPosted on May 3, 2007 Categories travel, videogamesLeave a comment on Monster Hunter Rally…Eh? Yesterday, we went to church in Deming in southern New Mexico. We walked around in the desert a bit with our friend, Eiland. He let me slide down a zip line he’d set up, along with many kid games that kept Sean amused. All over the ground was some kind of loco weed with lots of air-filled seed pods that you could step on and it would pop like bubble wrap. As we were leaving Deming, we felt a thump thump thump as we drove. Screw in the tire. Put on spare. Drove over to nearby shop and they repaired it. Wonder how they do that? It looked like gum protruding from the hole. Anyway, put the repaired tire back on, which took several times of jacking the car up and down, due to my incompetence. Drove to Hatch to get on freeway north to Albuquerque. Mistakenly headed south, wasting at least an hour’s time until Vanessa woke up and noticed the error. This reminds me, I need to start making sure I know where I’m going. Yeah, that’d be great. Here‘s a map of Napoleon’s town. You can click on the red arrows to see what happened there. I was just thinking how weird it would be to live in a small town like that and suddenly have strangers driving up to photograph your house or maybe even want a tour. Back from vacation. Que lastima! We went to Riverwalk in San Antonio. We took the boat tour around the city. Very scenic. Went to Rainforest Cafe. We walked around the Alamo a bit, but I was unable to find the basement. We went to Sea World there as well. Sean seems to have had hand, foot, and mouth disease. Boy, that sounds serious! But it’s actually just a minor illness that babies get. Unfortunately, his cousin seems to have gotten it too, since it’s rather contagious. Vanessa’s brother took us all to Chuck E. Cheese for Sean’s pre-birthday. Today’s his birthday. Sean seems to freak out when everyone is looking at him and singing Happy Birthday. Starts screaming and crying. We went to the beach in Galveston, which was quite fun. I always love swimming in the ocean. Sean liked it too. Warm water. The sand was very fine there and got all in the water, making it brown. Also covered the car, but blew off as we drove. Ate at Mediterranean Cafe in Galveston…very good. Later ate at Jame’s Coney Island hotdog place…very good. On the plane ride back, I had a stomach illness of some sort. I was getting pretty nervous on the plane and had to make sure the little baggies were supplied. Fortunately, I didn’t have to use one and made it through without incident. That was Sean’s last free plane ride, since he’s two now. Author nalterPosted on May 22, 2006 Categories family, food, travelLeave a comment on Eeee's back! Well, we’ve returned from San Antonio, where we were visiting Jeremy, to Houston with Vanessa’s brother’s family. Sadly, Jeremy’s MAME computer died the night before we got there, so we didn’t have major MAME sessions. Fortunately, he saved the day with several old consoles and some great older games. Had a good time, regardless of MAME unavailability. We got rare pictures of the Watsons! It was good to see them, since I haven’t in a while. Author nalterPosted on May 17, 2006 Categories family, travelLeave a comment on Yeeehaw!